For more than a year, we have only brought you little bugfix updates to make OpenMPT 1.27 more stable and improve some details, while working on OpenMPT 1.28 at the same time. It took us longer than expected, but now we are finally proud to release this new milestone, and it brings a great number of new features, improvements and bugfixes. On a personal note, this release marks my ten year anniversary as an OpenMPT developer. It has been a great time making this software better and better with every new release, and if you look back at OpenMPT's state in 2008, I hope you can agree that the software has matured a lot in this time. Here's to ten more years of OpenMPT development with many new features and other improvements! While preparations for the first OpenMPT 1.28 take a bit longer, we have decided to release another OpenMPT 1.27 update to correct a few problems. This also means that the example song competition has been extended as well. The first release of OpenMPT 1.28 is slowly nearing completion, and we already want to celeberate one of the upcoming new features with you: OpenMPT will finally gain support for synthesized OPL instruments in S3M and MPTM files! To make this new feature more easily discoverable, we decided to host a competition: Make a song using FM instruments and regular samples using either the MPTM or S3M format to show off the beauty of this synthesis combination. 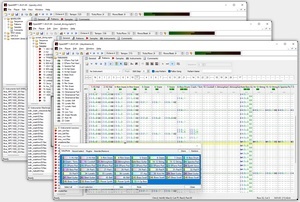 The best songs will become part of the OpenMPT example song package.